In Hinduism God is viewed as one and many (ekam bahulam). He is also described as both the known and the unknown, and the One with qualities (saguna) and the One without qualities (nirguna). He is compared to the sky or space, water, air, fire, the sun, the moon, consciousness, breath and even emptiness. He is both the subject and the object, immanent and transcendent, high and low, sacrificer and the sacrificed, creator and the created. According to some schools He manifests the objective worlds out of Himself using his materiality as the raw material and his dynamic energy or Shakti as the active agent of creation and transformation. According to some schools of Hinduism, creation is independently accomplished by Nature or Prakriti (Mother Goddess), while God remains a passive witness, without taking any active role in it. According to others, Prakriti is his dependent agent who acts under his inviolable will. Whatever may be the truth, the theories of Hindu cosmogony present a complex universe, which is without a beginning and without an end, and which consists of innumerable worlds and planes of consciousness. The worlds are inhabited by various beings and divinities, who possess different degrees of potency and intelligence and perform different roles in executing and enforcing the will of God. At the top of this universal pyramid and extending beyond it is Brahman in His undifferentiated and absolute aspect, while he also permeates the entire pyramid as its inner witness. The Upanishads describe that he manifests in creation as Isvara, the Lord. Isvara is Brahman’s reflection in the purity of Nature. The trinity of gods, namely Brahma, Vishnu and Siva occupy the second highest tier. They represent the three functional aspects of Isvara only. They are indistinguishable from Isvara. Hence, individually each of them is worshipped as Isvara himself. It is not uncommon for Hindus to revere them or worship each of them as the highest God. At the same time, ardent devotees of each deity regard the other two as inferior or subordinate gods. Especially, in ancient times the relationship between Shiva and Vishnu was one of rivalry. Followers of each considered the other as a rival god and treated his followers with disdain. Their attitude was also sometimes reflected in their literature and methods of worship. 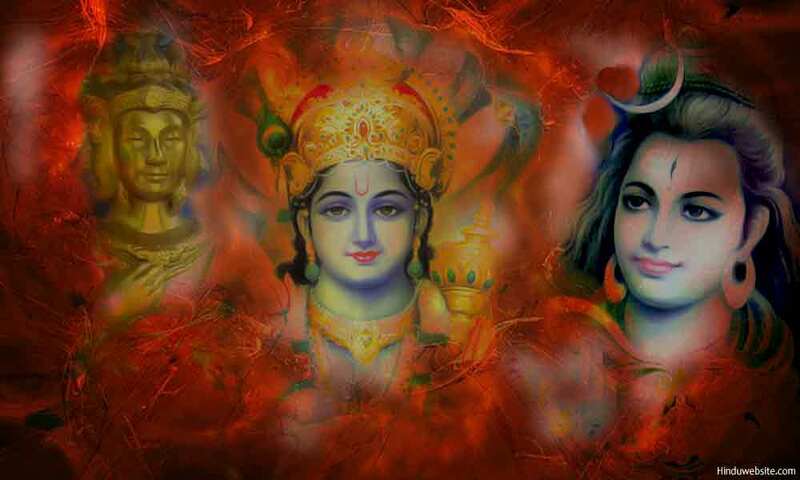 The Puranas describe the triple gods as Trimurthis (the three-forms). Individually, they are separate divinities, each having his own functions, worlds, names. forms, powers, potencies, consorts, associate gods and methods of worship. Although they reside in their own spheres, they work in harmony and coordinate their actions to ensure the order and regularity of the world. In upholding of Dharma, they also perform specific functions. Lord Brahma is the creator, Lord Vishnu the preserver and Lord Shiva the destroyer. The following is a brief account of the three gods. In the Vedas, Brahma is the physical aspect (Viraj) of Isvara and enjoys a unique place as the highest in the pantheon. The Vedic hymns do not give the same importance to Vishnu and Shiva, who became prominent in the later Vedic period. In the Vedas, Brahma is the father of gods, humans and demons. In importance, he is next only to Brahman or his higher aspects namely Isvara and Hiranyagarbha. He is also the teacher and ruler of all beings. Hence, he is known as Brahma Prajapati. According to the Vedas after manifesting from Isvara, he created the worlds and beings with his mind powers. The Puranas present a slightly different version. They describe that in the beginning of creation he emerged from the navel of Vishnu, sitting inside a lotus flower and holding the Vedas in his hands. In the iconography, he is depicted as having four heads and four arms. In one hand, he holds the Vedas, in the second a rosary, in the third a lotus flower and in the fourth a ritual ladle. The swan is considered his vehicle. Lord Vishnu is the preserver. He upholds the worlds by upholding Dharma and ensuring the order and regularity of the worlds. In the Vedas, he is described as one of the solar deities (Adityas), the god whose three strides covered the entire creation. The Puranas portray him as the god of love and compassion who responds to the cries of his devotees and rescues them from the ocean of suffering. He goes by numerous names. From time to time he incarnates upon earth to restore order and destroy evil. In the sacred literature, he is depicted as the god who is blue in color and holds a disc in one hand, a conch shell in the second, a mace in the third and a lotus flower in the fourth. Garuda, the divine eagle is his vehicle. Followers of Vaishnavism revere him as Brahman himself. Lord Shiva is the destroyer. He is portrayed in the Puranas and the Upanishads as the God of renewal as well as destroyer, who rules the body as breath. He is also the revealer and concealer of spiritual knowledge from people and grants them liberation according to their merit. At the end of the Time Cycle, he destroys the worlds and dissolves them. Shiva was probably worshipped in pre-Vedic cultures and gained prominence due to his personal appeal as the god of healing, sickness and death. Parvathi is his consort and he lives on the snowy mountain of Kailash in the Himalayas with his children, Ganesha and Kumara and his entourage of devotees, ascetics, and a large army of ferocious warriors and ganas. Nandi, the sacred bull is his vehicle. Apart from having distinguishing features and unique functions, each of the Trinity gods has their own Shaktis, who are considered aspects of Mother Goddess or Universal Mother (Devi, Mata or Mahashakti). Goddess Saraswathi is the consort of Lord Brahma. She is the goddess of knowledge and learning and thereby compliments the functions of Brahma. Lakshmi, the goddess of unsurpassed beauty, wealth and prosperity, is the consort of Vishnu. Parvathi, who is also known as Uma, Gauri and several other names is the consort of Shiva. The River goddess, Ganga, who is her sister, adores his head. These shaktis are considered the triple aspects of the Primal Mother or Prakriti. They also have numerous other manifestations and associate forms and are worshipped individually as well as in association with their lords. Symbolically, the three gods represent various things at various levels. They exist both within creation and outside of it. They exist in us also as consciousness, energy, will power, thoughts, emotions and qualities. The whole universe is made of the three powers and sustained by the three powers. Hence, the triple gods are found in their subtle states in almost every object and aspect of the universe. Presented below is the symbolic significance of the Hindu Trinity, and how they are hidden in various aspects of creation. The symbolism is strictly limited to their functional aspects only as part of the general Hindu pantheon and popular Hinduism, but not to their highest aspect as Isvara and his numerous manifestations, which form part of the sectarian traditions of Shaivism and Vaishnavism. 1. In the microcosm of an individual, Brahma is the mind and ego, Vishnu intelligence, and Shiva the body. 2. Brahma is the mental power of the person, Vishnu spiritual power and Shiva physical power. 3. In any action, Brahma is the intention, Vishnu the motivating power, and Shiva resistance. 4. In life Brahma is birth, Vishnu life and Shiva Death. 5. Among the organs, Brahma is speech, Vishnu the heart and Shiva the breath. 6. Within the mind, Brahma represents thoughts and ideas, Vishnu reason and purpose and Shiva feelings and emotions. 7. In any endeavor or sacrifice Brahma is the introductory part, Vishnu the middle part and Siva the concluding part. 8. In the flow of life Brahma is the forward movement, Vishnu the balancing movement and Shiva the opposing movement. 9. In the cosmos Brahma is the sky, Vishnu the Sun and Siva the moon. 10. In the regions, Brahma is the upper region, Vishnu the middle region and Siva the lower region. 11. In the day, Brahma is morning sun, Vishnu the daylight and Siva the twilight. 12. Among directions, Brahma is East, Siva the West and Vishnu the region in between. 13. In the Vedic Pantheon, Brahma is Prajapathi, Vishnu is Aditya and Shiva is Rudra. 14. In the triple worlds Brahma is the lord of Vedic gods, Vishnu the lord of human beings and celestial beings and Shiva the lord of animals and subterranean worlds. 15. Of the Gunas or modes of Nature, Brahma represents Rajas, Vishnu Sattva and Shiva Tamas. 16. Among the paths of salvation, Brahma is the path of selfless action (karma yoga), Vishnu the path of knowledge (jnana yoga), and Shiva the path of renunciation (sanyasa yoga). 17. Of the seasons, Brahma is Spring, Vishnu Summer and Shiva Autumn and Winter. 18. Among the Vedas, Brahma is the Rigveda, Vishnu Samaveda and Shiva Atharvaveda. 19. In life Brahma is childhood, Vishnu the adulthood, and Shiva the middle age, while Isvara represents the old age. This symbolism is explained in greater detail below. In the life of an individual, the Trinity play an important role. They preside over the three phases of human life namely childhood, adulthood and middle age, just as they do in creation also. Brahma represents the first phase, Vishnu the second phase, Shiva the third phase and Brahman or Isvara the fourth phase. In the Vedic tradition, the four phases are called ashrmas (resting places) and the duties associated with them are collectively known as Dharma. Since the duties varied from caste to caste, the practice was known as Varnashrama Dharma. It is no more practiced in contemporary Hinduism, except in rare cases, but in the past it formed the basis of the Hindu way of life. The correlation of the four deities with the four phases of human life is important, because by knowing it people can invoke the presiding deity of each phase for achieving progress in life. The hidden symbolism of the triple gods in the Varnashrama Dharma is explained below. In Vedic society, this phase began with the initiation of children into education, and continued until their marriage. The phase was known as Brahmacharya, meaning the practice of Brahmahood, or more specifically celibacy. During this phase, students lived in the households of their teachers (gurukuls), and mastered the knowledge of the scriptures under their guidance. The teacher symbolized Brahma, the divine teacher in human form (Acharya devobhava), who like Brahma acted as the sole source of all Vedic knowledge. Just as Saraswathi, the goddess of learning, was the companion of Brahma, knowledge (Vidya) was the constant companion of the students, as they pursued Vedic studies, practicing practising siksha (education) with discipline and cultivating buddhi (intelligence) moral purity (sattva), character (samskaram) and knowledge of dharma (religious duties). Brahma is the first god to manifest during creation. Hence, symbolically, every new born baby is Brahma. It is why tradition declares that the words of a child are the words of Brahma (bala vac brahma vac). When the students completed their education, they returned home and joined as apprentices (snataka) under their own fathers or under an experienced priest. Their lives as householders (grihasta) began when they married and took up their family profession and householder duties. Symbolically, this phase is represented by Vishnu. Just as Vishnu preservers the worlds and ensures the order and regularity of the worlds through his sacrifices, a householder preserves his family and its orderly progression to the next generation by performing his obligatory duties such as the daily sacrifices and offerings to ancestors. Similarly, just as Vishnu helps those who are in need or who seek his protection, a householder leads a responsible life, helping others, protecting his children, honoring guests, elders, seers and pious people and setting a personal example by abiding in virtue and Dharma. In this phase, he seeks health, wealth harmony, name, fame, status, and progeny. In this phase, just as Lakshmi, the goddess of fortune serves as the consort of Vishnu and helps him in the preservation of the worlds, wealth in all its form enables the householder to support their families and meet, their obligations to gods, humans, animals, seers and ancestors. Varnashrama Dharma suggests that when a householder discharges his duties and obligations to his family and society, he may retire from active duty into forests or a secluded place and live like a hermit or a recluse to study the scriptures, practice spirituality and prepare for liberation. In the Vedic tradition, it is called vanaprastha, going to the forests. In contemporary world, we may call it the post retirement phase. People no more go to the forests or retire entirely from worldly life. They may at the most start taking interest in spiritual subjects, listen to discourses, read religious literature, go to temples or sacred places, join spiritual organizations and spend time in communes. Symbolically the phase is represented by Shiva, the destroyer. Just as Shiva destroys and dissolves the worlds, in this phase a person has to destroy his selfish desires, relationships, old habits and attachments to free himself from the bonds of the world and prepare for liberation. For people who are passing through this phase, Shiva is the best role model. He has children, a wife, a friend as Ganga, several dependents and many responsibilities. Yet, occasionally he also withdraws into himself and goes into meditation. He also leaves Kailash to visit graveyards and secluded places to practice spirituality and remain aloof from the world. People during the retirement phase are expected to live in this fashion. They may still act like the elders in the family and occasionally help their children with their knowledge and experience, but should not ignore their spiritual practices or their goal of liberation. They should also practice self-purification and spiritual transformation, cultivating virtues such as compassion, truthfulness, self-restraint, humility, selflessness, charity, faith, surrender and devotion, which are essential for their progress on the path. The last phase of human life in Hindu tradition is sanyasashrama, or life as a renunciant. It began when a person gave up worldly life, cut asunder his family and social bonds including his name and family name, and renounced sheltered life and the use of fire including for cooking. From then on he was expected to live an uncharted and unplanned life, without a shelter, subsisting on meager food and gradually subjecting his body to rigorous austerities and emaciation.